Can You Sew During The Summer With Kids Home From School? It can be a major challenge keeping up with your business, whether it be sewing, doing alterations, craft projects or making those items to sell online when the kids are out of school for the summer. 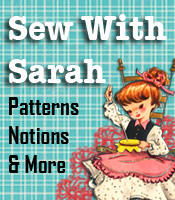 This would be a perfect time to get the kids interested in sewing and craft projects. I have a few suggestions that might help get you started. For the younger children (3-7 age range), you can easily get them started learning how to sew with our “E-Z Sew Sewing Cards”. There are six different categories (circus, farm, sea creatures, space, assorted and cowboy). Each category comes with six different items to sew. The child can use a shoe string to sew the objects, or an older child could use a long blunt needle, threaded with yarn to do the sewing. My grandchildren spent HOURS sewing the various objects while I was doing my regular sewing! If your children/grandchildren are old enough to do some regular sewing machine sewing, you might want to check out the “Learn How To Sew” book. This book gives YOU information you’ll need to get them started, as well as sample sewing pages that they can “sew” with no thread in the machine. As you move forward in the sewing process, this book contains hand sewing projects, as well as many simple items the child can easily cut out and sew on the machine. My 11 year old granddaughters are very creative and are doing a great job of sewing simple things. This summer they will be making simple pull over blouses and skirts. One granddaughter says she wants to make a quilt, so that’s on our list. Another granddaughter (also 11) has already gotten the “pattern making” bug — she has made the pattern for a narwhal stuffed toy, then proceeded to make the toy. She just decided one day what she wanted to make, got some paper out, drew out the pattern, then did the cutting, hand sewing and stuffing! I’m really proud of her – great beginning for a life long love of sewing, crafting and creating! 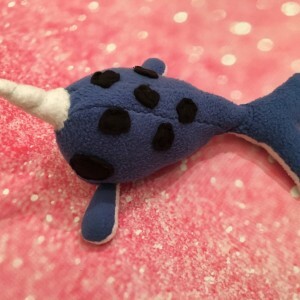 Here’s a picture of her narwhal stuffed toy: She did step by step directions on how she made it – so we’ve added her pattern project to our craft pattern page. We can’t wait to see what she comes up with next! It’s never too early to start teaching the kids how to be creative. I’ve already made a list of projects for my grandchildren for the summer — don’t wait until the last minute then get flustered because you weren’t prepared for the. I don’t know about the weather where you are, but here in Florida it appears that Spring may have been left out this year and summer jumped right in! Regardless of the temperatures, it’s very much time for all of us to begin our regular “new season” sewing. I’d like to recommend you check out our recently re-vamped PatternsThatFitYou site for dozens of great patterns. Sewing for plus size children can be the hardest thing to do as there can rarely be anything found that will fit the overweight children. PatternsThatFitYou has pattern making classes and regular packaged patterns for those hard to fit children. If you’re looking for something for yourself, whether a regular size or full figure, PatternsThatFitYou has pattern classes designed just for you. There are classes for slacks/shorts, blouses, dresses, sport bra and many others. I’m so excited about getting my spring/summer wardrobe made and already have fabrics lined up for myself as well as for my grandchldren. Let us know what YOUR sewing projects are! Happy Sewing!